Euro rebounded from the level of 38.2% once again. Later we can expect the pair to continue falling down. The target for the bears is the area, where there are 4 fibo-levels from different fibo-extensions and backward corrections. At the H1 chart we can see, that the sellers are making their first attempt to push the price towards the minimum. By now the current correction has already reached the level of 61.8% and at the moment is rebounding from it. According to the analysis of temporary fibo-zones, predicted levels may be reached by the end of the week. Franc is moving close to the level of 50% (red dot line). If the price rebounds from this level, the pair will start a new ascending movement and break a local maximum. 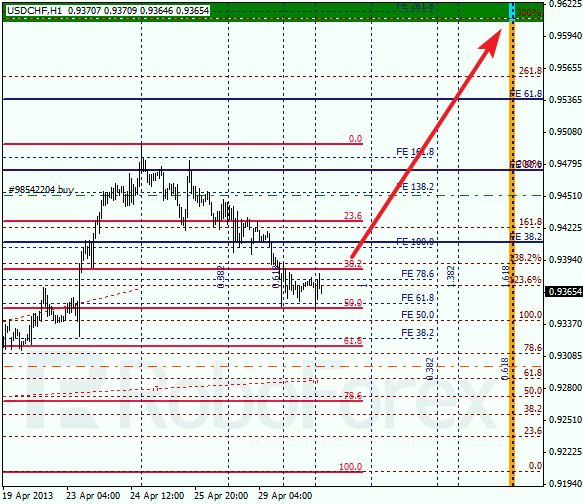 The target for the bulls is the level of 0.9610. At the H1 chart, the pair is consolidating. I’m planning to open one more buy order as soon as the price passes the level of 0.9450. According to the analysis of temporary fibo-zones, the target area may be reached by Friday.